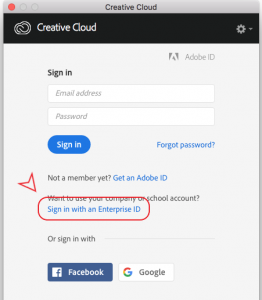 The Adobe Creative Cloud Suite is available to all current Williams faculty and staff employees directly from Adobe. Employees are able to sign in and download Adobe CC apps on both personal and OIT issued computers. Each user is entitled to two activations per account. Software can be installed on additional computers but a third activation will require the deactivation of one of the two initial activations. Use in multi-user lab or classroom environments will not count as part of the two-activation limit. 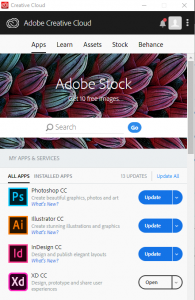 NOTE: Adobe Acrobat DC (Pro) , used to edit PDFs, and the Adobe Creative Cloud desktop application will be pre-installed on all new computers issued by OIT. To use either simply run the app. If a sign-in box appears click ‘Sign in‘ then ‘Sign in with an Enterprise ID‘ then enter your Williams email address. You then will be directed to a google sign in page to finish the authentication. Once the CCDA installer starts you will be presented with a sign in box. Click the sign in button then Click 'Sign in with an Enterprise ID' and enter your Williams.edu email address. You will be directed to a google sign in page to finish the authentication. 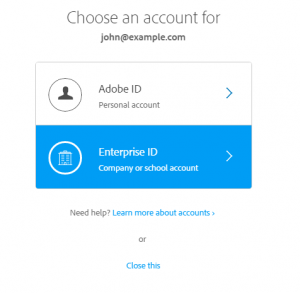 You may at one time have had a personal Adobe ID set to your Williams email address. If that is the case you will see the following options. 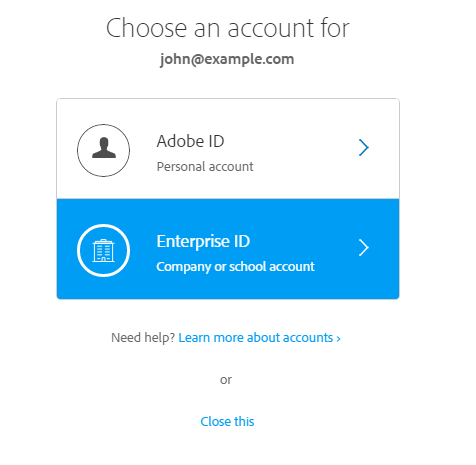 Choose enterprise ID to continue with the Williams license. The Creative Cloud desktop app will not install. 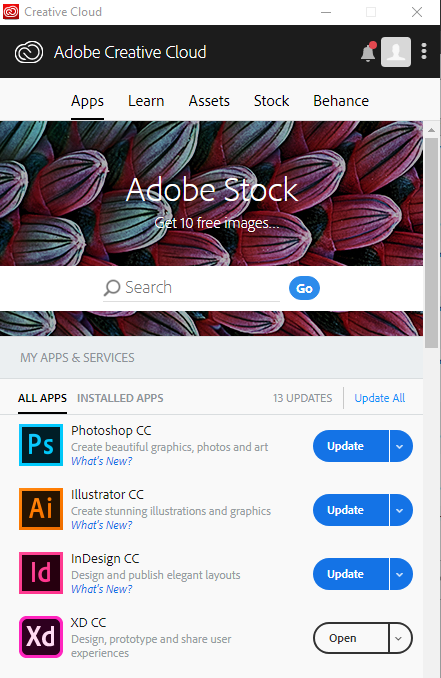 Once successful you can browse, install, and launch any of the Adobe CC apps from the CCDA. To install an app click the app section within the CCDA. Here you will see a list of the available apps. Next to each will be an install, update, or open button depending if you have that app already on your computer. 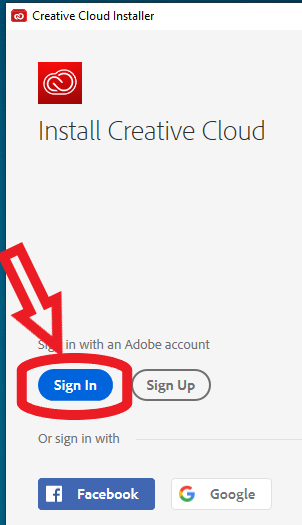 Open the Adobe app you would like to use and you should be presented with a sign in box. Click 'Sign in with an Enterprise ID' and enter your Williams.edu email address. You will be directed to a google sign in page to finish the authentication. Once logged in the app should open and fully function.